Our internal car environment is nowadays equipped with numerous wireless applications, such as automotive aftermarket accessories but also future scheduled connected car systems (Vehicle to Everything) will extensively make use of wireless communication. Due to the vast increasing level of EMC noise caused by such systems, it becomes evident to take counter measures to prevent that this can have a negative influence on the proper operation of other on-board electronics systems. The new R1525 was especially tailored for this purpose and has the capability to reduce EMC noise in the high-frequency band from 10 MHz to 1 GHz, providing a stable output voltage. Compared to predecessor generation products the transient response has been significantly improved, only minor and short peaks will occur at the output voltage as a result of input or load transients. The new CMOS-based R1525 is robust enough to survive in harsh conditions; it operates up to 42 V and even tolerates load dump surge peak voltages of 60 V with a duration of less than 200 ms. The minimum operating voltage starts at 3.5 V, which makes the R1525 suitable to use even at severe cranking conditions. The product will be available in a version targeted for the consumer, industrial and automotive application market and has customized operating temperature ranges, respectively -40 to 105°C, -50 to 125°C and -40 to 125°C. As for the automotive version, it is scheduled to become AEC-Q100 compliant soon. Another important feature is to minimize current consumption for automotive applications that are continuously active, extending the operational lifetime of the battery. 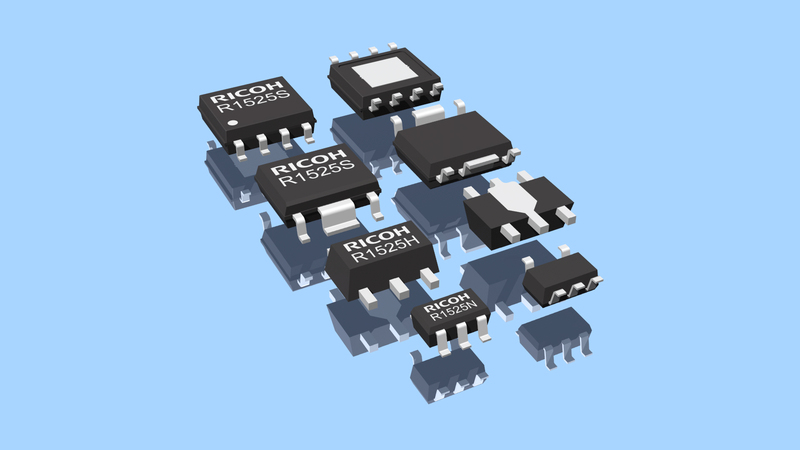 The R1525 contributes to reduce current consumption with 2.2 µA in On-mode and 0.1 µA in Off-mode. The R1525 has an excellent output voltage accuracy of 0.6% and low temperature drift coefficient of only 60 ppm/°C, making the product suitable as a power source with high reliability. Short protection, an embedded fold back short current limit circuit detects a short circuit and decreases the output current to a safe level of 80 mA, after removing the short the regulator resumes to normal operation automatically. Protected pin lay-out, a special lay-out was arranged for the R1525S in HSOP-8E package preventing a failure when adjacent pins are shorted. All four regulator terminals are isolated with not connected adjacent pins. Thermal protection is incorporated and will turn off the regulator when an over-temperature of 160°C is detected and will resume to normal operation again as soon a temperature of 135°C is reached. Target applications for this regulator are for example applications with a direct battery connection, ECUs, Infotainment, Security System, Dashboard Systems, Remote Keyless Entry, Immobilizer, Gateway etc. The R1525 is available in four different packages, ranging from SOT-23-5, SOT-89-5, HSOP-6J and HSOP-8E.